The ERASE (Expect Respect & A Safe Education) Bullying Strategy builds on the Province’s Safe, Caring and Orderly Schools Strategy (2004), which focussed on creating schools where students are free from harm, where clear expectations of acceptable behaviour are held for all members of the school community, and where there is a sense of connectedness. ERASE Bullying will help ensure every child feels safe, accepted and respected, regardless of their gender, race, culture, religion or sexual orientation. ERASE Bullying also builds on effective programs already in place and will ensure there are consistent policies and practices across all 60 school districts, backed by strong community partnerships and support. Created by Canadian father and educator Bill Belsey. Bullying Awareness Week is an opportunity for people at the grassroots level in communities around the world to get involved in this issue, not by waiting for "Someone else" to do something, but rather for us to work together on preventing bullying in our communities through education and awareness. 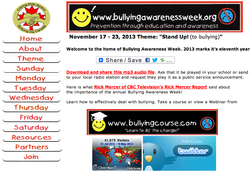 Bullying is a major problem in our schools, workplaces, homes, and over the Internet. Over the next few weeks on The Christy Clark Show, I will be helping raise awareness on these issues and my guests will hopefully give us all the tools needed to stand up against bullies and step in when we see it happening.